My name is Aiza Generalao, and I live in Pangantucan, Bukidnon, Philippines. My story starts when I was four years old. When I was a little girl, my parents did not understand each other, and there was much conflict in our home. There were seven children born in our home. I am the youngest. At the time I was four, some of my older siblings had their own homes. My parents spent much time at odds with each other. This was due to the fact that my father spent much of our money on alcohol. Almost every time my father returned to our home he was drunk. My parents had a farm, and the produce was sold sometimes for a good price. My father would be wealthy for one day, but the next day he would spend the money on alcohol. This would leave no money for food; so my mom had to go to the neighbors and beg for food. She did not like to do this. She felt ashamed. 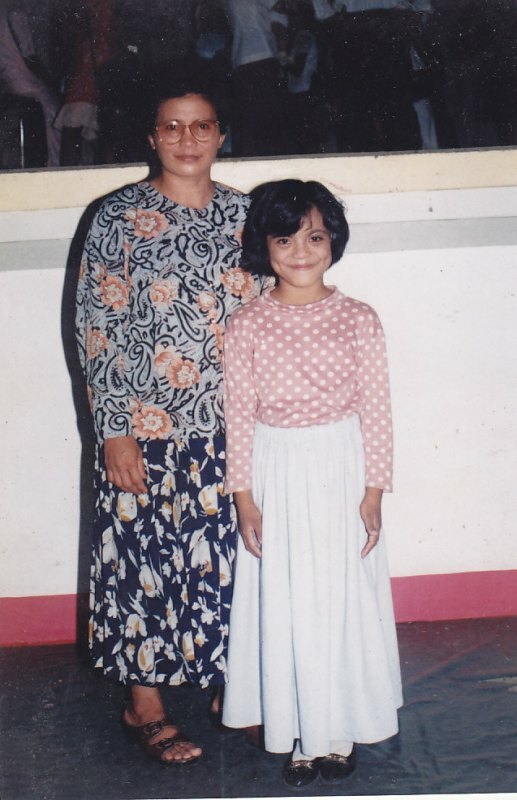 Aiza as a young lady with her mother. The conflict grew, and they were both extremely angry with each other. They would shout at each other and ignore their children. My mother would say that she was very tired of this life. One night my father came home very drunk and argued with my mother. The other children remained quiet. I ran to my mother and put my arms around her. My father took out his hacking knife and threatened my mother. I called for help, but no one heard. He dropped the knife and tried to get me away from my mother, but I held on to her. He grabbed a chain and swung it at my mother, but it hit me instead. My mother held my hand, and we ran fast away from my father to some friends of my mother’s. I was in terrible pain. The neighbors put hot compresses on my back, and I was able to sleep. We stayed for some time with these people. My mother heard that my father was going to Zamboanga and taking my six-year-old brother with him. We went back to live in our house, and my mother planted cassava so that we would have something to eat. Every Sunday, we went to the Catholic church. My mother was a very devoted Catholic. She sang in church and led special prayer services. One day as we were returning from church, three people were waiting at our door. They were Seventh-day Adventists. They presented the love of God to us and shared some from God’s Holy Word. One of those who shared with us was Mejing, who is Temtem Piedraverde’s (Bible worker) aunt. They came each week to share Bible truths. My mother did not believe that Saturday was the day of worship and resisted other teachings. She would ask me to tell them that she was not there when they came. They finally stopped coming. Sometime after these visits from the Seventh-day Adventists, my mother started reading and studying from the Bible she had. She found that Saturday is the true day of worship and that God blessed it. She decided not to attend mass any more. One day she took me with her for a long journey of three kilometers. We stopped at the Seventh-day Adventist Church and climbed the ladder. We stood in the door and just looked around. No one invited us in as they thought my mother was there to sell bananas, and they did not buy on Sabbath. I had on shorts, and my mother had on long pants. We left and returned to our home. The next Sabbath we both put on dresses and made the long journey to church again. Betita, the church elder, met us at the door and invited us in. He apologized for thinking she was selling bananas the previous Sabbath. My mother was asked to sing, and I enjoyed the children’s meetings. We continued to attend church, and my mother took Bible studies. Our neighbors started to be unkind to us because we were learning many new teachings from God’s Word. This did not bother my mother; she just continued to learn and grow in her walk with Jesus. My mother decided to be baptized and dedicate me to the Lord. My brother and my sister were angry with her because she changed her religion. My father returned from Zamboanga and intended to take me back with him. My mother did not want to see him or have any more troubles with him; so we stayed with an Adventist family. This family sent me to school while my mother worked to support me. She finally left me in the care of this family. They treated me as one of their children. I was taught how to cook, clean and care for my clothes. I watched them as a family and felt sad that our family was not a happy family. After two years, when I was eight years old, my brother and sister asked my mother to get me so I could live closer to them. They also were able to get my brother that had been with my father. My mother continued to work and did not live with us. I was living with my eldest sister and her husband. I was a child in my faith and believed in the Sabbath and not to eat abominable things. That was my basic religion. My sister’s husband became an assistant to the priest. He always insisted that all animals that God created were clean. I would listen to him but keep my mouth shut. He also said that the Sabbath was only for the Jews. He said I would go to hell if I did not worship on Sunday. They were angry because I would not believe them. I tried to attend church on Sabbath, but they had reasons that I could not go. One day they slaughtered a pig and tried to get me to eat it. I would not. They punished me, and many days I was hungry. My sister fried some chicken in lard made from swine. As I was ready to eat, I could smell that it was different and would not eat it. This made my sister angry again. They were trying to trick me. My brother just older than me, our nephews and I stayed in a rented house that my sister paid for so that we could go to school. There it was easier to eat as I knew I should, but sometimes there was only cornmeal to eat. It was sad for me as there was no Seventh-day Adventist church close to where we lived. My nephews did not continue to go to school. My sister could not afford to send my brother and me to school any longer. The priest adopted my brother,and he was able to continue his school. A blessing came into my life, I thought. A friend of the family came to my sister’s home and invited me to come and live with their family and be a companion to their daughter. I continued my studies as I lived in their home, but life became worse instead of better. They treated me as a servant, and if I did anything wrong they would call me an idiot. At the end of the school year my brother Dodong came and got me to live with him and his wife in Davao City. He was angry that my mother and sister had let me live with others. His wife treated me very well as long as my brother gave her money when she wanted it. If he did not she would be angry and mean to me. She did not feed me properly. She blamed me for her problems. I went to school in Davoa City. I was able to get a scholarship, so the tuition was less for my brother. At this time I had not attended church on Sabbath for a very long time. I still was obedient to the Bible and ate only what the Bible says is clean. At the private school, I was required to say the Hail Mary and honor the Virgin Mary. When I refused, I was sent to the principal’s office. I explained that I could not pray to someone who is dead. This made the principal angry, and I was threatened that if I did not do as was required I would lose my scholarship. At this time I auditioned to sing and was accepted. I slowly became involved singing at the masses. I was beginning to forget about the Sabbath. My brother was not active in his church and only went to mass on Christmas and other holidays. I had no example. I graduated from high school, and my brother could not afford to send me to college. I got a scholarship and attended college at HCDC (Holy Cross of Davao College), taking classes in Hotel and Restaurant Services. After a year and some months, I did job training at hotels in Davao City and worked on the Sabbath if it was required. I finally finished and graduated. My brother was very proud of me and had a party to celebrate. There was liquor and food that is not according to what the Bible says we should eat. Although I was not keeping the Sabbath, I could not eat these things or drink the liquor. 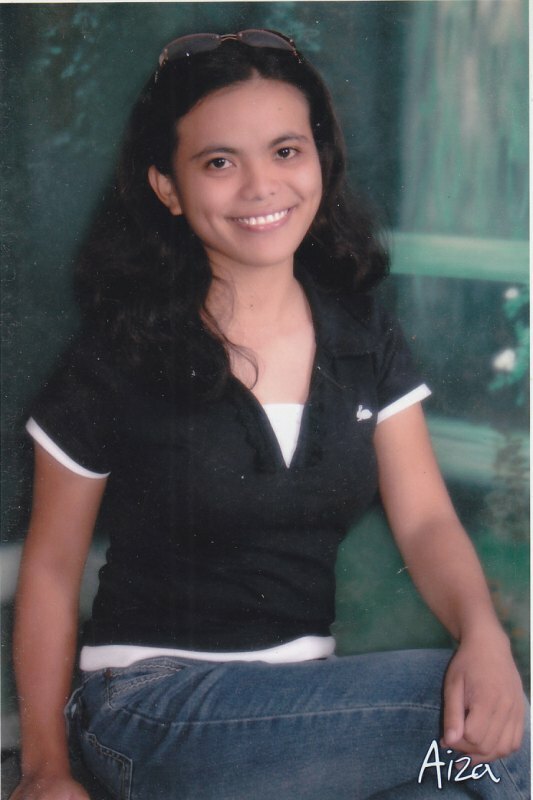 Earth’s Final Warning littering the streets led Aiza back to a full commitment to God. I took a rest after graduation. I then sent out some resumes to different motels looking for work. One day, as a friend and I were at a motel giving our resume, I told my friend that I would be going back to the barangay (township) a different way. I decided to walk and not to take the jeepney. As I walked, I saw lots of pamphlets scattered around on the ground. I picked them up, thinking they were comics. I love to read. When I got home, I noticed that these were Earth’s Final Warning. I noticed an article on Daniel chapter two and a picture of Nebuchadnezzar. I wondered if one local Seventh-day Adventist church had distributed them in the barangay. I read the article on the prophecy of Daniel two and saw the word VICARIUS FELII DEI and that the total was 666. What I read scared me, and I remembered some of what I had been taught as a child. I saw the picture of the pope in Earth’s Final Warning. After I read this, I took a rest and went outside and talked to my friends. I could not believe the words coming out of my mouth telling them of this prophecy. As I visited with my neighbors, I found that some of them are backsliders like I was. When I went back into the house, I felt complete. I went out and sat by a tree and sang songs to the Lord. I had a dream about a big red Bible. I found it in the home of my sister and asked her to take care of it. The next night I dreamed of a church full of flowers. I shared my dream with a friend. The friend said that maybe God was calling me to go to church. The next Sabbath I found a church. I felt strange and uncomfortable, but everyone made me feel welcome. I told my friends and two of them that had backslidden joined me the next Sabbath. As time passed, I met Brother Temtem. He told me of the church in Impasug-ong. When I arrived, I found that it was the church from my dream. I enjoy the Bible studies. I have been baptized and dedicated my life to my Savior. I am now twenty-three years old. I am active in my church and other churches. I have preached and become a song leader. I give courage to those in spiritual need. I continue my work in the hotel business. I never work Friday night or Sabbath. Jeremiah 31:3 is very precious to me: “The Lord hath appeared unto me, saying, yeah, I have loved thee with an everlasting love; therefore with loving kindness have I drawn thee.” May my story draw each of you closer to Jesus. By Temtem Piedraverde. Support for the work in the Philippines can be sent to Mission Projects International, PO Box 59656, Renton, WA 98058.